The mid-century modern Silver Spring Library by noted local architect Rhees Evans Burket, AIA, is facing an uncertain future. The county has put out a request for proposals from developers to turn the site into senior housing and child day care facilities through either incorporating the existing building or knocking it down and starting from scratch. Local activists, including the Silver Spring Historical Society (SSHS), are urging any development plan to integrate the existing structure into the future design. Proposals are due Feb. 28. A vintage rendering of the low-slung library. Courtesy of the Silver Spring Historical Society. Burket (1899-1963), a Silver Spring resident, was a noted architect in the D.C. area for his homes, commercial and public buildings, including schools. His Stratford School in Arlington, Va., is on the National Register of Historic Properties. It seems that only after all of these wonderful mid-century libraries are gone will people understand what was lost. Adaptive Reuse! 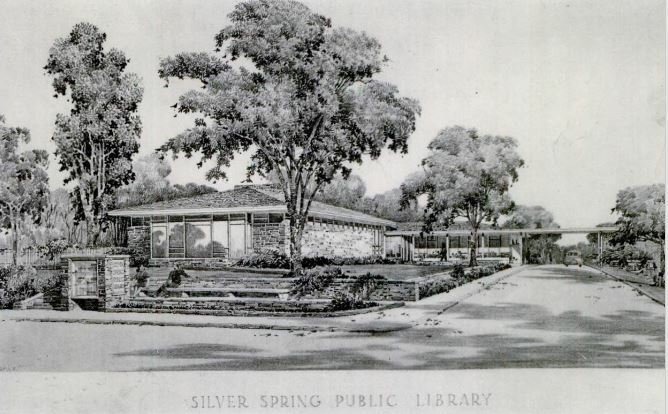 Silver Spring Historical Society enthusiastically supports adaptively reusing our former 1957 Silver Spring Library designed by leading Metro D.C. area architect, Mo Co Civic Leader, and Silver Spring resident Rhees Evans Burket, along with its environmental setting and its parking lots of 2.35 acres to continue to serve the community. Just as it integrates itself into the hilly landscape, it’s a perfect fit to serve the community! In “harmony with nature,” this “Parkitecture” building and its setting are Burket’s legacy gift to Silver Spring and Montgomery County. One excellent vision for adaptive reuse is as a Children’s Center; with immediate access to the adjacent Ellsworth Urban Park and Playground! Kids’ Gardens can spring up in the green and treed lawns surrounding Burket’s Library. What a hands-on healthy green learning tool for the kids! “The formal merger of the S.S. Library and other participating libraries into the County library system took place on July 1, 1951. Takoma Park, Rockville, and Bethesda elected not to join the system initially, although Rockville and Bethesda joined later. The S.S. Library with its two branches and large reference collection, was the linchpin of the new County system. “A New Library on Colesville Road. The County began planning for a new S.S. Library. Rhees Burket, a local architect, was hired to design the new building. . . . County Library Board unanimously approved the site on Jan. 21, 1954” [Oshel, Bob & Friends of the S.S. Library, “The S.S. Library, 1931-2001: Enriching Lives for 70 Years,” P. 8]. Inspired by Frank Lloyd Wright’s “organic modernism,” “in harmony with nature,” his 1957 S.S. Library of stone and glass and brick, integrated into the hilly landscape, was the largest County library at the time. This public building is Burket’s legacy to Silver Spring and Montgomery County. Burket’s Mid-Century Modern structure, “ ‘an architect’s dream,’ was the phrase used to describe the new S.S. Library when it was given its final inspection last Th. Morning by the County Manager, the County Council, and several members of the County Library Board,” The Maryland News, 12/28/1956. Built on a 200-footwide strip running from Colesville to Ellsworth Drive, on land given by the Hecht Co., “the Building was designed to fit into the naturally landscaped lot which adds to its attractiveness. The few trees that had to be moved to make way for the building were saved and replanted. The many dogwood, blue spruce and beech were undisturbed,” The Maryland News, 2/28/1956. “Rhees Burket, the Architect, went all out on this building. And from the looks of things he had a fairly free hand in design and equipment. . . . . if the sign wasn’t out front we doubt if you would guess it to be a library. It looks more like a new home built by some Texas oil or ranch man . . . . we would suggest you stop by this beautiful building and take advantage of the books and the atmosphere. You will thoroughly enjoy it,” Silver Spring Record, 1/26/1957. “Library Pioneer” Journal in “A Dream Comes True,” glowingly describes with photos and floor plan diagram Burkett’s elegant, light-filled library structure and its conveniences, attached, Sept./Oct. 1958. Frank Lloyd Wright’s “organic modernism,” “in harmony with nature,” is expressed in Burket’s structure with its low horizontal lines, low-pitched hip roofs and projecting eaves to create an integrated-into-the-landscape quality. A massive fieldstone chimney rises at the axis of intersecting roof planes. Library has a cross-shaped open floor plan. Walls of native uncoursed stoneyhurst stone, a polychrome mica schist, quarried at Seven Locks and River Roads, Montgomery County, appear to undulate in juxtaposition with glass and aluminum framed window walls, awning windows, continuous bands of clerestory windows and red brick walls. Stone chimney and several stone walls carry through into the interior spaces of the singular structure. An elegant, very long and wide, approx. 70’ X 20’, flat-roofed entrance canopy doubles as a carport for auto pick up and drop off point welcoming patrons arriving via the access road. Three large canopy roof openings allow light and moisture into the raised planter beds below. This building is unique; there is no other community structure of this style in all of S.S.’s CBD, or adjacent. Testing a comment so I can style it! Thank you Marcia. What a great historical description. It is truly worth saving, not only for future generations of citizens but young architects to see how sensitive great design adapts to it’s surroundings with harmony to the environment. Thanks again. I thought I better post another comment. And, this is a reply comment to June’s above. Need to figure out how this will work, too! William Jones Rhees also at the age of 22 along with two 21-year-young colleagues co-founded the YMCA in D.C. in 1852, one of the 6 original YMCA’s in the country! Rhees, 1830-1907, served as YMCA Secretary, Librarian, and President! In his will, Grandfather Rhees bequeathed a lifetime membership in the YMCA to his Grandson [our unique Library’s architect to be!]. Thanks to all for your positive comments! Tues., 2/28, 4 p.m., deadline for proposals for adaptive reuse of Burket’s Endangered S.S. Library and its Land is rapidly approaching! Have Been In Search Of imaginative, visionary architects/firms! Burket’s Library currently serves as an amazing Already-Ready Read Book Store, including records, CDs, other, etc! It’s open every day of the Week! Come Enjoy! 2 Proposals for the former S.S. Library and site were unveiled 10/4/17. Gudelsky Proposal! Other Proposal unfortunately does not incorporate. Please refer any questions/clarifications to me, thank you, do appreciate! multi-cultural Child Development Center to be operated by CentroNia, child care experts, and includes community space. Affordable Senior apartments will be provided advantageously in the Silver Spring CBD. Gudelsky Foundation fully funds capital developmental costs for the whole endeavor! Their responsive Proposal allows a treasured public structure and its land to continue to serve the Public. The Silver Spring Historical Society applauds and supports the Gudelsky Proposal! Looking forward to working together to achieve and celebrate the adaptive reuse of Silver Spring’s unique former Library, “in harmony with nature,” and its continuing service to the community: Rhees Burket’s legacy gift to Silver Spring and Montgomery County! Interior and exterior Photos are available.